Silver Spring, MD; October 15, 2018 – Acorn TV, North America’s most popular streaming service focused on British and international television from RLJ Entertainment, Inc. (NASDAQ: RLJE), offers a unique mix of gift possibilities for Anglophiles and lovers of British mysteries and dramas. Called a “glorious streaming service… an essential must-have” (The Hollywood Reporter) and “Netflix for the Anglophile” (NPR), Acorn TV is available in a gift subscription for just $49.99/year. 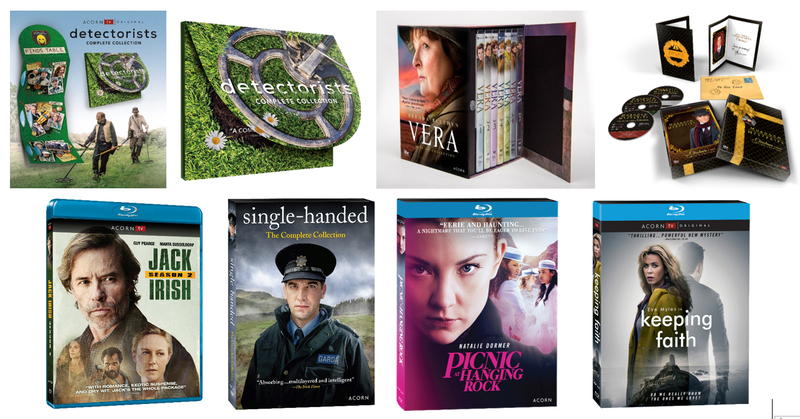 Additionally, deluxe DVD sets include the complete series of universally adored British comedy Detectorists starring BAFTA-Award winners Mackenzie Crook and Toby Jones; hugely popular British detective drama Vera: Sets 1-7 Collection; smash hit Canadian period mystery series Murdoch Mysteries: The Christmas Cases Limited Edition; and Irish police drama Single-Handed: The Complete Collection. Available at select retailers including Amazon. For TV lovers, Acorn offers several smash hit, critically-acclaimed series on Blu-ray, including Guy Pearce’s return in conspiracy thriller Jack Irish, Season 2; British drama Picnic at Hanging Rock; smash hit mystery series Midsomer Murders, Series 20; heartwarming drama The Good Karma Hospital, Series 2; Canadian hit Murdoch Mysteries, Season 11; international sensation and Acorn TV Original Keeping Faith; among many others. Acorn TV exclusively premieres high-quality, original and exclusive British and international series every week from Great Britain, Australia, New Zealand, Ireland, or Canada. Acorn TV features a deep library of mysteries, dramas, and comedies with no set end dates or commercials. In 2018, Acorn TV premiered new seasons of British mystery Agatha Raisin, heartwarming New Zealand drama 800 Words, Aussie dramedy The Heart Guy, and the final seasons of BAFTA-winning comedy Detectorists and Aussie period drama A Place to Call Home; as well as new series, including British drama Girlfriends, Welsh dramas Hidden and Bang, Irish drama Blood, British high school drama Ackley Bridge, Paul Abbott’s No Offence, Mystery Road starring Judy Davis, among many others. All three seasons of the universally adored, BAFTA®-Award winning BBC comedy starring Mackenzie Crook (Game of Thrones, The Office [UK], Pirates of the Caribbean), who also wrote and directed the series, and Golden Globe- and Emmy-nominated actor Toby Jones (Captain America, Harry Potter, The Hunger Games) as two oddball metal detecting enthusiasts scouring the English countryside for treasure while dealing with their messy personal lives. The first seven series of the smash hit British detective drama starring Oscar® nominee Brenda Blethyn (Pride & Prejudice, Atonement) as Detective Chief Inspector Vera Stanhope, a cantankerous, but brilliant detective who solves unthinkable crimes in northeast England. Special Limited Edition of the holiday movies of the smash hit Canadian and Acorn TV period mystery series. Garnering an amazing 45 Gemini® and Canadian Screen Awards nominations from the Academy of Canadian Cinema & Television during its run, the series centers on Detective William Murdoch (Yannick Bisson), a methodical and dashing detective, who enlists radical new forensic techniques to solve some of the city’s most gruesome murders. Filmed against the spectacular and foreboding backdrop of Connemara, Ireland, Owen McDonnell (Killing Eve, Dominion Creek) stars as Jack Driscoll, the lone Garda sergeant whose personal life is inextricably bound with his professional duties in his insular community. Nominated for best drama series at the Irish Film & Television Awards and featuring an excellent cast including Matthew McNulty (The Terror, Lark Rise to Candleford), Simone Lahbib (Loch Ness, Wire in the Blood), and Ian McElhinney (Game of Thrones), plus guest stars including Oscar® nominee Stephen Rea (The Crying Game) and Caroline Catz (Doc Martin).